When I got the call from the front desk that the new server had arrived, I will admit that I looked at my coffee cup and wished it had something a bit stronger in there. At the same time I could hear Angelina Jolie whispering inside my head that this was too much machine for me. I’ve never been one to back down from a fight though and so this David went to confront his Goliath. Waiting for me were two boxes, one with two power cords (how nice of them to supply an extra one for a monitor I thought), and one box containing the beast itself. The larger box proved a good deal heavier than its size led me to believe but after careful lugging to a vacant desk and a mental note to visit a chiropractor I started to unpack it. Inside the Ikea inspired (this is a good thing) packaging awaited a highly attractive server a minimal documentation pouch giving a list of online resources, a couple of Cat 5 cables and several adapters that mystified me. I had a feeling that I should let the air flow around the machine and so rightly or wrongly decided to balance it on three points on the sturdy packaging rather than placing it flat on the desk. Looking around I located USB ports for a keyboard and mouse and started to look for a CRT socket. This is the first point where my lack of experience with purpose built ‘proper’ servers was exposed because there isn’t one. Throughout this trial I’m going to be saving my searches and online resources on My Del.icio.us so if anyone reading this is looking for resources please feel free to check there. The search resulted in me finding Graeme and his Getting started With a Sun T2000 entry on his Notes from a Messy Desk Blog. Sun have obviously been taking notes on the experiences of people with the trial because there was a discrepancy between Graeme’s experience and mine. I had worked out after attaching both power cables to the back of the Sun Fire (ahhhh that’s what the other one was for) that it was probably a bad idea to go ahead and connect it to the mains and so was slightly worried when he mentioned that I would need a console cable which was not supplied, and should contact a Sun reseller to get one. For those people who will need to contact Sun during their trial and are used to the less than efficient responses of other corporations I can whole heartedly endorse Sun. The phone rang and was then answered immediately by a human being who was armed with knowledge. Slightly shocked I explained my question and asked whether I could use the cat 5 cables supplied or if I would need to obtain another cable. Notes were taken and a promise to email back was made. Somewhat surprisingly the answer arrived by email within half an hour. I could indeed use the cables supplied. In true heroic story format I had a bit of a Flashback to my youth when my own personal Obi Wan Kenobi (Jonathan Semple) taught a keen 18 year old about setting up a system console on SCO Unix using serial cables. Suddenly the adapters supplied made sense and so I fitted one end of the Cat 5 cable to the system console port on the Sun Fire and the other end to the 9 pin serial to RJ45 adapter I then found out that my modern Sony Vaio laptop didn’t have a serial port. Of course this also led to the realisation that I didn’t need to have the USB keyboard and mouse connected to the Sun Fire either and disconnected them. 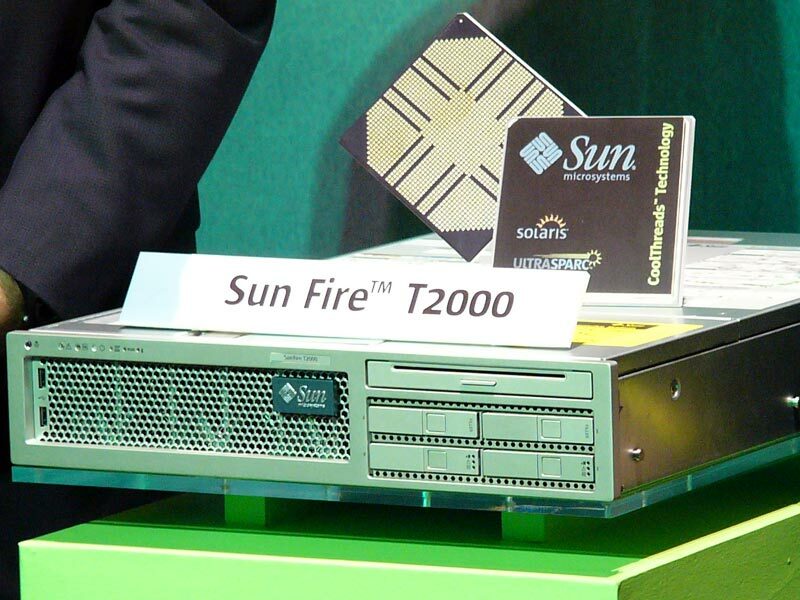 The serious point to make is that setting up the Sun fire is probably best achieved with the addition of whatever old desktop you happen to have laying around, as this is more likely to have an available serial port. Loading up HyperTerminal I took Graeme’s advice again and set it up to connect through Com1 at 9600 bps with 8 bits 1 stop bit and No parity and also no flow control whatsoever (yeah let it flow free man!). In today’s modern world the whole concept of serial communication is probably going to be alien to a lot of people, but trust me, it really is a piece of cake if you stick to the settings above. I was now ready to switch on and so after taking a mental brandy I plugged in and the machine quietly came to life and presented me with green lights and a whole load of diagnostic information in HyperTerminal. This is actually a good point that if nothing appears in your terminal window then you’ve done something wrong and should check that you’ve plugged the cable into the right serial port and have the settings correct. At this point you will see a system prompt and what the machine wants is its IP Network settings. Probably like a lot of small agencies we outsource our network to an external company who support Windows boxes only, and so I had to go and ring them to get a vacant private IP address, which took longer than 3 minutes and resulted in the machine dropping my connection to terminal. Reconnecting didn’t help and I couldn’t find a reset switch on the box and so I elected to unplug and re-plug the cables into the mains which didn’t seem to have an adverse effect on the box and then enabled me to set my network settings with the following commands. Of course I also realised that I was going to need more IP addresses than just the one and so called our IT company again (a conversation worthy of an entry on its own – “Exactly how many do you think your going to need?”). The bare minimum I suggest is two, one for the management console and one to connect to make the machine available to the rest of the network, but you should also note that the serial network management port displays more diagnostic information than the IP address connected port does and so having some sort of access to a serial console is still a good idea. I think I already mentioned that I was setting the machine up at a vacant desk in the office. Ours is not a large office and so everyone else around was treated to the two fans blasting and masking the sound of the air conditioning, any attempts at telephone conversations and destroyed any hope of people more than 4 feet away hearing what you say to them. I’m not kidding, this is not a quiet machine and in hindsight I should have put it away in a rack in a room before doing this. Once in there was no stopping me and so after promising to buy everyone affected a drink later, I ran ‘console –f’ where the rest of the computers configuration was set. To be honest this did give me a few problems. I had chosen PC Console as the emulation type in Hyperterminal and i’m thinking I set this incorrectly because the menus I was presented with selected the option above the one I actually set, which led to a certain amount of fiddling about as I corrected my time zone from Australia to Europe. Things like the computers name seemed to go without incident and so I entered ‘Rosco’ after Rosco Tanner because he was a big server (Big Server.. gettit?). What did give me problems was setting up a name server. Our network is a bog standard Windows network without frills and so after my attempts to set-up ‘none’ failed I had to work my way through the list before I found an option which didn’t lead to an error preventing me form going any further. Finally I set it to DNS and entered our basic DNS details although this did later result in an error when Rosco couldn’t find himself listed in it (predictably). I’ve made a mental note to establish local DNS for the office so this should sort itself out through the next few days. Basically though this was job done for getting a server established and so I entered ‘shutdown’ which took the machine back to single user mode and then ‘poweroff’ to give everyone’s eardrums a break. It was now time to set Rosco in his rack in the computer/filing/box room. Now I’ll freely admit that I never had a Mechano kit when I was a kid but even with that caveat I found assembling the rack mount the most difficult part of the job. At one point I had one detached arm connected to the server and some sort of telescopic light saber swaying precarious as I attempted to fix the other side. Eventually I found a release button which detached the remaining arm but to me the instructions supplied were not intuitive enough. Success was only really achieved when I got one of the junior account executives to help me steady things as I screwed them into the rack. Having said that, once this was done, the machine slid in without problems and seated very comfortably and securely in place. Cables were re-attached but the dual requirement of a network port for the machine and a network port for the management console was something I hadn’t considered prior to the machine arriving and only one spare one was available. There wasn’t room for another machine and so I used the serial management connection to plug into the back of the Windows server in order to free up the single port to connect it to the network. Currently I have to use the windows box if I want to do any maintenance on the sun box and cannot do so over telnet. I’ve made a mental note to buy one of those mini stackable network hubs from PC World which should sort the problem out. That was really day one completed, and a well deserved beer was removed from the agency hospitality fridge. As a side note some of you may be wondering why i'm running this as an internal machine when the applications I want to run are clearly designed to be public. The answer is that firstly the machine isn't configured to be public yet but the main reason is because those wodnerful people at BT have not (after 2 attempts) been able to configure our asyncronous internet connection correctly, and therefore I just don't have the badnwidth yet to test anything and won't until Friday at the earliest. Use the Force Luke !